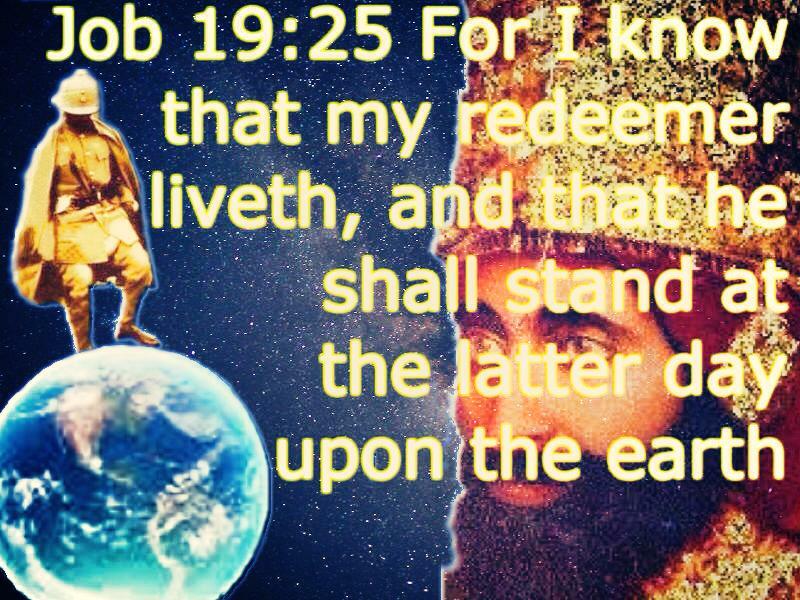 InI as Ethiopian Hebrews I-ccepting the only begotten of this time Yeshua HaMoshiyah, InI black Lord and Savior, from the blackness of the womb HE is the light that illuminates the atmosphere, for we are the brass but his light makes it fine, HE is the fine brass. A light that is unapproachable that no man has seen or can see. HE is the Lion of the Tribe of Judah, African people, people of the world HE is our Lion, His name explains HIM as the Power, the Might of the Trinity. 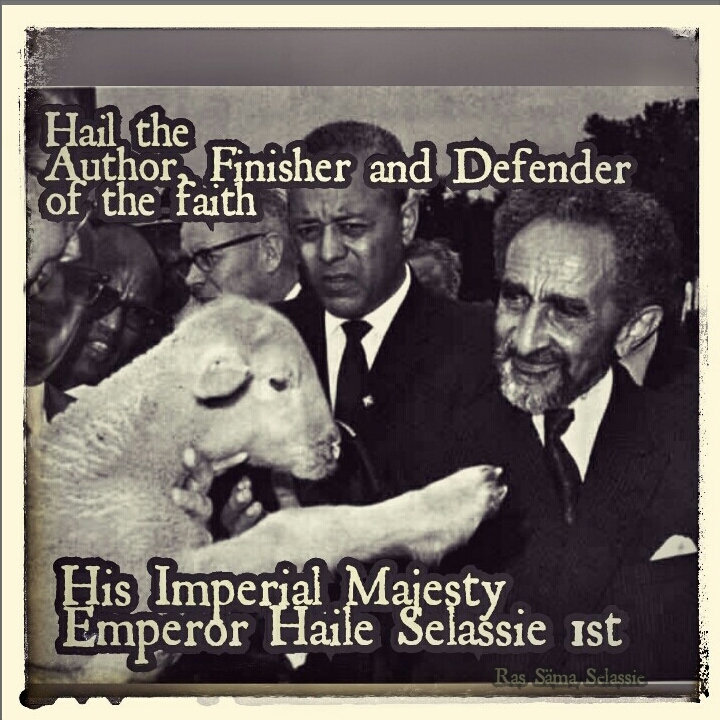 Haile Selassie I is not only the Man of the Millennium but the Man of the hour. Hail the Son of Man that comes in the glory of the Father, Jah Rastafari. I am writing to the I, that InI God and King warned and prophesied his exit, the signs and his words were present and now that it has happened what will happen now? 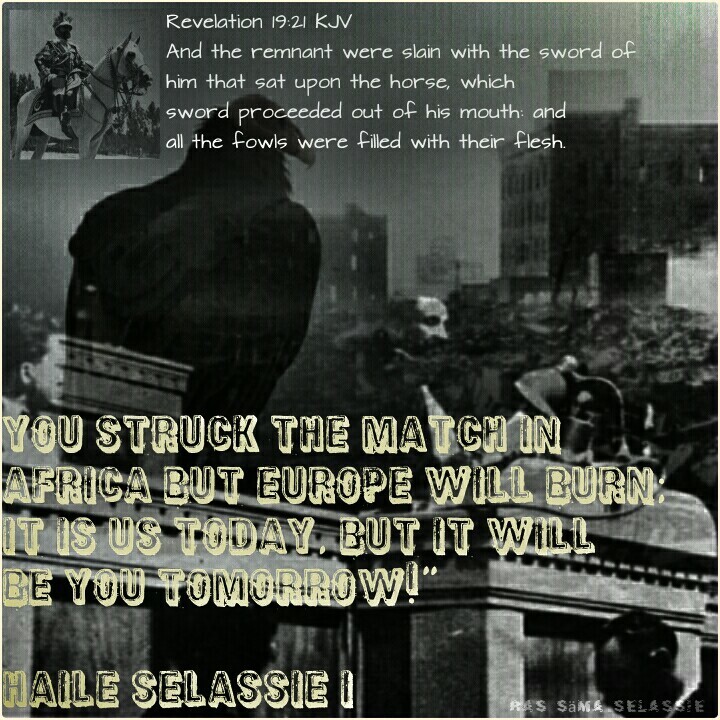 So let I lead the I into this revelation HE gave to I, in the Important Utterances of HIM Emperor Haile Selassie I. The Speech from the Throne 1965 under his Change Nature’s Law HE writes..New questions shall be posed to our ancient, traditional and customary habits of thought. Long – held conception and beliefs shall come under ever closer critical scrutiny and examination. Our response to these challenges will decide the future. What was happening in 1965? The 1960 Ethiopian coup was the coup d’etat staged in Ethiopia on 13 December 1960 to overthrow Emperor Haile Selassie. While he was away on a state visit to Brazil, four conspirators, led by Germame Neway and his older brother Brigadier General Mengistu Neway, who was commander of the Kebur Zabangna (the Imperial Bodyguard), took hostage several ministers and other important personages. 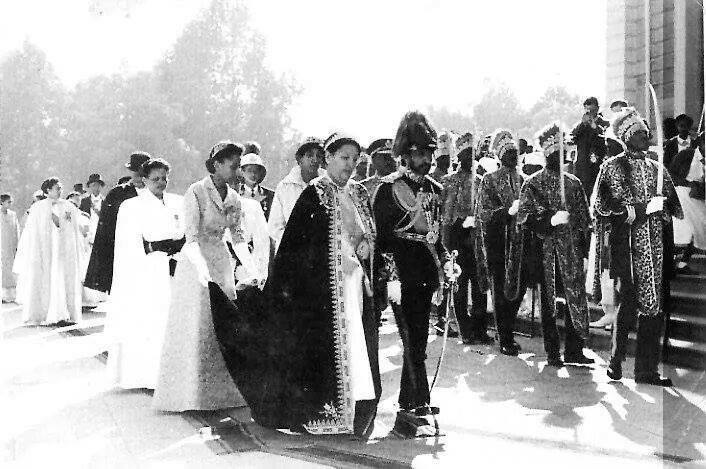 Then after taking control of most of Addis Ababa, the capital of Ethiopia, they declared the regime of Haile Selassie had been deposed and announced the beginning of a new, more progressive government under the rule of Haile Selassie’s eldest son, Crown Prince Asfaw Wossen, that would address the numerous economic and social problems Ethiopia faced. Despite a demonstration of support by the students of Haile Selassie University, the other military units remained loyal and worked together to crush the coup. By 17 December, loyalists had regained control of Addis Ababa and the conspirators were either dead or had fled the capital. A number of experts of Ethiopian history consider this event the most serious threat to Haile Selassie’s rule between his return to Ethiopia in 1941 and his deposition in 1974 during the Ethiopian Revolution. I will also like to add, what another faithful has shared with I on the matter of the 1960 coup and the type of advice that was given to HIM. The key person or third mastermind, was Colonel Workneh Gebeyehu, a man who was a Cabinet member and Chief Security Officer of the Emperor. He belonged to those who “were able/allowed to wake HIM up” (while HIM was sleeping). Before 1965 there was also the Ogaden war (August 1963 till December 1964) and the start of the” Eritrean War of Independence” (September 1961). Haile Selassie I knew that the day will come that there will be forces in his own homeland that will be against HIM but not just HIM but also the tradition, customary habits and beliefs of this ancient kingdom. Give ear to my words, O Lord , consider my meditation. Hearken unto the voice of my cry, my King, and my God: for unto thee will I pray. My voice shalt thou hear in the morning, O Lord ; in the morning will I direct my prayer unto thee, and will look up. For thou art not a God that hath pleasure in wickedness: neither shall evil dwell with thee. The foolish shall not stand in thy sight: thou hatest all workers of iniquity. Thou shalt destroy them that speak leasing: the Lord will abhor the bloody and deceitful man. But as for me, I will come into thy house in the multitude of thy mercy: and in thy fear will I worship toward thy holy temple. Lead me, O Lord , in thy righteousness because of mine enemies; make thy way straight before my face. For there is no faithfulness in their mouth; their inward part is very wickedness; their throat is an open sepulchre; they flatter with their tongue. Destroy thou them, O God; let them fall by their own counsels; cast them out in the multitude of their transgressions; for they have rebelled against thee. But let all those that put their trust in thee rejoice: let them ever shout for joy, because thou defendest them: let them also that love thy name be joyful in thee. For thou, Lord , wilt bless the righteous; with favour wilt thou compass him as with a shield. What is intriguing about all of this is that it didn’t take the Psalmist David to share with InI that these same powers are against the King and his anointed, the powers that be are wickedness (Ps 2:1-12) and working to remove the monarch, the Defender of the faith but our King of Glory , Haile Selassie I kingdom is without end and is here, within every man’s heart that is willing to recieve this. We must also look at this act of the people on a global scale. 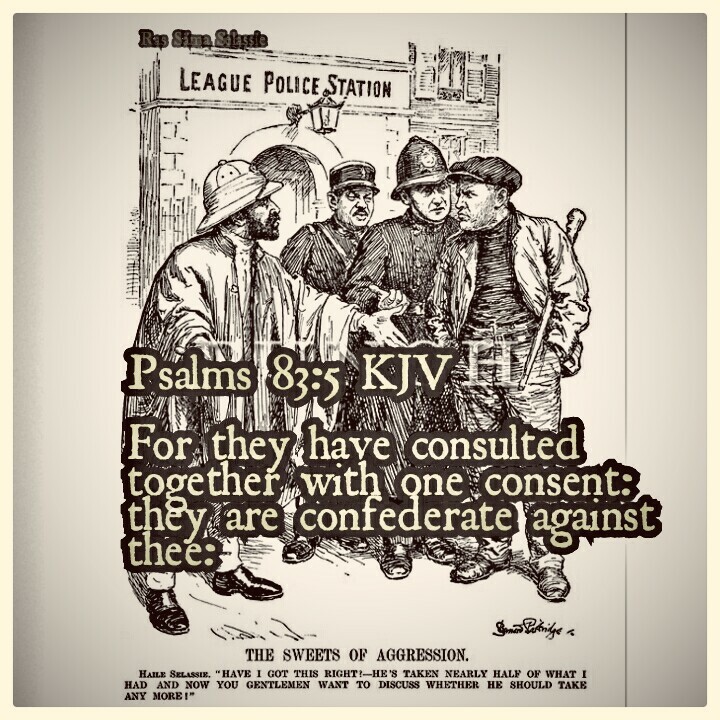 We have churches from Roman Catholic to the Protestant church in the inner city on every other corner who do not acknowledge the Ethiopian throne nor the Promise Yahweh made with his beloved King in Psalms 89. If you haven’t read it, here is the chapter. For I have said, Mercy shall be built up for ever: thy faithfulness shalt thou establish in the very heavens. I have made a covenant with my chosen, I have sworn unto David my servant, Thy seed will I establish for ever, and build up thy throne to all generations. Selah. And the heavens shall praise thy wonders, O Lord : thy faithfulness also in the congregation of the saints. For who in the heaven can be compared unto the Lord ? who among the sons of the mighty can be likened unto the Lord ? 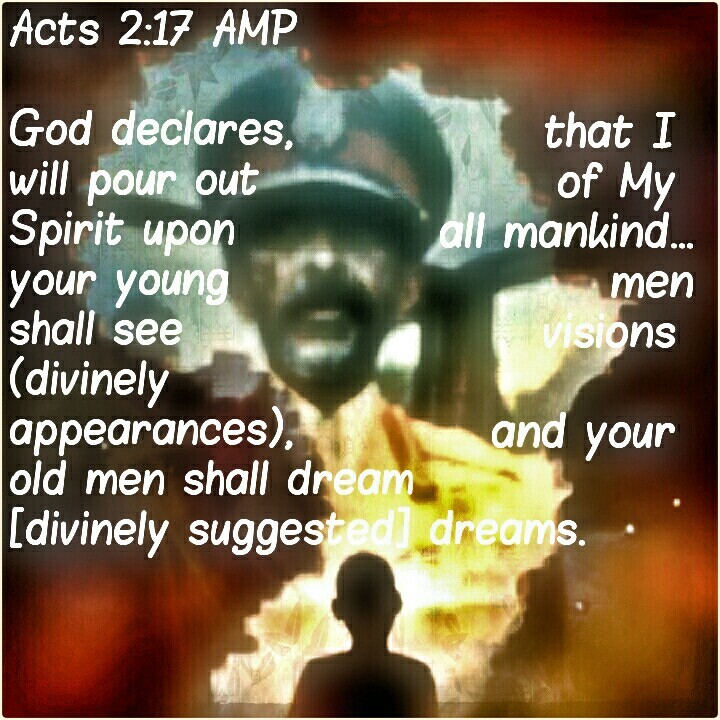 God (Yah Ras)is greatly to be feared (Tafari) in the assembly of the saints (Christian/Rastafari), and to be had in reverence of all them that are about HIM. 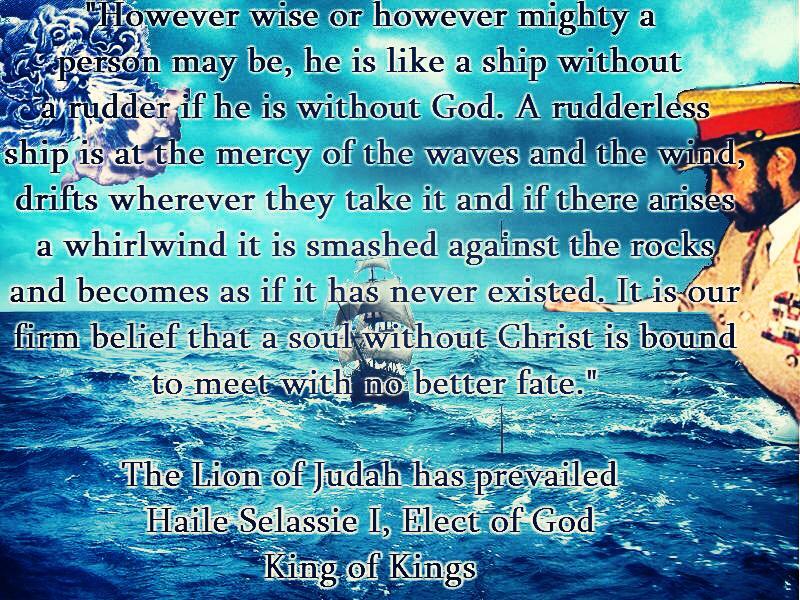 O Lord God of hosts, who is a strong (Haile) Lord(Selassie) like unto thee? or to thy faithfulness round about thee? Justice and judgment(Makonnen-to judge) are the habitation of thy throne: mercy and truth(Iyesus) shall go before thy face. Blessed is the people that know the joyful sound: they shall walk, O Lord , in the light of thy countenance. In thy name shall they rejoice all the day: and in thy righteousness shall they be exalted. The enemy shall not exact upon him; nor the son of wickedness afflict him. And I will beat down his foes before his face, and plague them that hate him. Also I will make him my firstborn(Yeshua), higher than the kings of the earth. My mercy will I keep for HIM for evermore, and my covenant shall stand fast with him. His seed also will I make to endure for ever, and his throne as the days of heaven. If his children forsake my law, and walk not in my judgments; If they break my statutes (like Prince Asfaw Wossen), and keep not my commandments; Then will I visit their transgression with the rod, and their iniquity with stripes. My covenant will I not break, nor alter the thing that is gone out of my lips. His seed shall endure for ever, and his throne as the sun before me. It shall be established for ever as the moon, and as a faithful witness in heaven. Selah. Thou hast made void the covenant of thy servant: thou hast profaned his crown by casting it to the ground. Thou hast broken down all his hedges; thou hast brought his strong holds to ruin. All that pass by the way spoil him: he is a reproach to his neighbours. Thou hast set up the right hand of his adversaries; thou hast made all his enemies to rejoice. Thou hast also turned the edge of his sword, and hast not made him to stand in the battle. Thou hast made his glory to cease, and cast his throne down to the ground. The days of his youth hast thou shortened: thou hast covered him with shame. Selah. How long, Lord ? wilt thou hide thyself for ever? shall thy wrath burn like fire? Remember how short my time is: wherefore hast thou made all men in vain? I find this chapter very important because it discusses the importance of the throne of David, for Yahweh has made a covenant, a promise to HIM and his seed that it should rule forever, it also speaks of the tribulation that David shall go through. We almost must understand that this coup is bigger than the man Tafari Makonnen, this coup removal is against the King of kings and the Lord of lords, The ROOT of David, Jesus Christ, the Lion of Judah. These people, the military and the students that went against the Christ. For Christ prophesied that they will hate you because they first hated me. These prophecies are being fulfilled. The Lion of Judah, Haile Selassie I has come and fulfilled one act, HE smote the nation’s with the Rod, the sword from out his mouth. We must not deny these things, from out of his mouth war and turmoil ravaged the land. Tafari Makonnen is the blood-bought man, meaning that HE is the seed of David, in the second coming to testify unto the world. Today the customs and tradition of having the Seed of David sit on the throne of David in Ethiopia is refused by the people; if this is what the people want then so be it. For our God is not a rapists, He doesn’t force anything on anyone, the same way HE didn’t force the people to serve HIM when they were asking for a king to rule them like other nations. Jesus have said while walking in the earth, that I don’t condemn you for the fact that you don’t believe you are condemned already. John 3:18- who don’t believe is already condemned. Nobody knows for sure, for there is a consistent sighting with some people, We can all see HIM in our Visions and Dreams, if you first accept Jesus Christ as your Lord and Savior and if you are blessed to see HIM without confessing Christ then it is up to you to honor his teachings and advice. They said that he had been found dead in his bed by a servant, and that the cause of death was probably related to the effects of a prostate operation Haile Selassie underwent two months ago. The broadcast said that the once-revered “Lion of Judah’s” only surviving daughter, Princess Tenagne-Work, visited the former Emperor Tuesday at his request, after he had determined that his health was rapidly deteriorating. But in London, Crown Prince Afsa Wossen Haile Selassie, who has been living abroad since the leftist government in Ethiopia formally declared an end to the monarchy last March, said his father had been in “excellent health. The first name of the servant is Eshetu. And what he saw was ” a not moving body”. Nothing more. (source: ILij A.W.Asserate). The prostate operation, so the personal doctor from HIM stated in several sources, went good and HIM was “healed”. According to Lij A.W. Asserate, member of the Imperial Family, no-one made any test (DNA) from that bones found in 1992. The family, the Government and the Church wanted to close the “story” and just declared it. But there was a reason for everyone. Beside the “silence” it was a after-legitimation for the “Emperor-in-exile”. Lore Trenkler (former cooker of their Majesties 1960 till 1974). She wrote that one time the Emperor disappeared. They found HIM only through the noise in the city. He just went out through the back-garden-door, and no one saw HIM. So how did (H.I.M) he die? Mengistu dismisses the question with a shrug,.. There is also a report that his bones were found in 1981, but he wasn’t buried till 2000..nothings add up except for this one consistecy. One thing that is consistent of all those who report it, is that it is called MYSTERIOUS. How bout that? They can’t fully explain it with certainty, they label it mysterious. For it is a mystery. He is alive, hear the testimony of the Rastaman. It is not uncommon for an Emperor to become a hermit, king Lalibala was a hermit before becoming a king. He was very dedicated to Jah, a man who received instruction through his own visions and dreams. The King built the rock hewn church and story has it that he had help from angels. It can be a possibility that Haile Selassie is a monk, a Bahitawi in the Ethiopian hills. 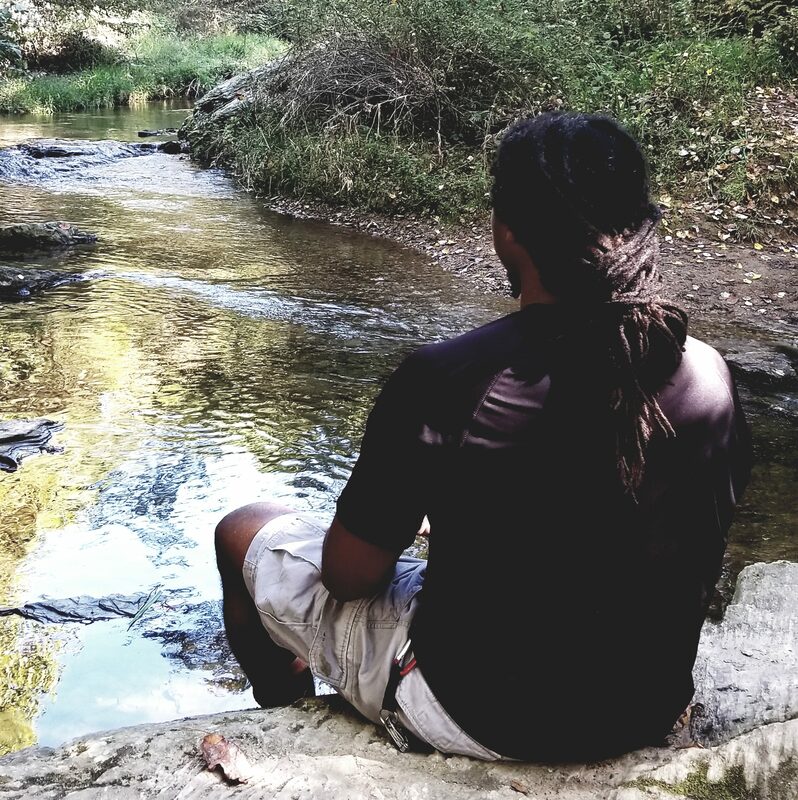 For I personally, I view his existence like Jesus, God is with I but I can’t naturally see the I, but i can testify that he reveals himself to those that he chooses for we see HIM in the terrestrial, as a spiritual entities. When he wants to be seen. And Iman is grateful for it. I think that Tafari Makonnen was changed just like Iyesus from flesh and blood to flesh and bone. Changed like Enoch to never see death as a reward For his firm faith in Jah. During the coronation Abuna Kyrillos prayed, may you receive this crown eternally, I testify unto you that he has. He remained faithful to the end. Many judge his progress and accomplishments as a Emperor which can be a vain argument, for we should watch how he served Jah in the most crucial times and never broke his stride in doing so. He is our example, and as I write this I feel convicted because I know that I can do better with my own faith. So what did HIM mean when he said, New questions shall be posed to our ancient, traditional and customary habits of thought. Long – held conception and beliefs shall come under ever closer critical scrutiny and examination. Our response to these challenges will decide the future. 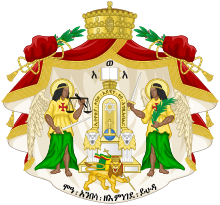 It’s quite clear that Ethiopia will no longer stretch their hands unto Jah, not all but good amount will be in favor of destroying the monarchy and looking for new rulership just like how they were looking for rulership in the days of Samuel. They refused Haile Selassie I, Jah in the end. So Jah left to never be seen again by the natural to only to be revealed to those who love HIM, that has the seal of Jah in their foreheads. I remember reading in his autobiography that it is custom that when an Emperor died, he was given a private burial and his heir was coronated but in this case the Throne of David is vacate, there is no Emperor in Ethiopia currently, only meaning that the last, Omega is still sitting as the first, Qedmawi Haile Selassie on the heavenly and earthly throne of David.